Fixed gear. You and the bike are one, brain gives way to cog, crank arms are mere extensions of your legs and vice-versa. You are a cycling cyborg, part human, part machine, unsure where the steel ends and the flesh begins. Only the smile on your face reveals the human. Riding a fixed gear bike is special. This much you’ll discover the first time you ride fixed and stop pedalling. The best things in life are the simplest. Extravagance is an absurdity best left to those vainly searching for happiness at the bottom of their wallet. Silence. Starlight. Sunrise. The sea. The touch of a loved one. The smile of a stranger. A Bob Dylan lyric. A cup of coffee. Bubble wrap. A shed. Single speed bikes. One cog, one gear, many cadences. Riding a fixed gear bike is cycling in its purest, simplest form. Reducing life to its essential elements reminds you what it is to be human. Cooking with fire. Being naked. Although not necessarily at the same time. The less we have, the less we stand to lose and the less we can be distracted. Riding fixed, dérailleurs cannot break and gears cannot slip. That’s not to say Luddites should rule the earth. I welcome change and progress yet it is easy to forget the origin of why we began to evolve in the first place. Rarely do we look upon fire, the wheel, and the bicycle with the awe of when they were first discovered or invented. Progress isn’t always essential despite the claims of the marketing men and women who strive to make anything seem necessary. Electronic gears. 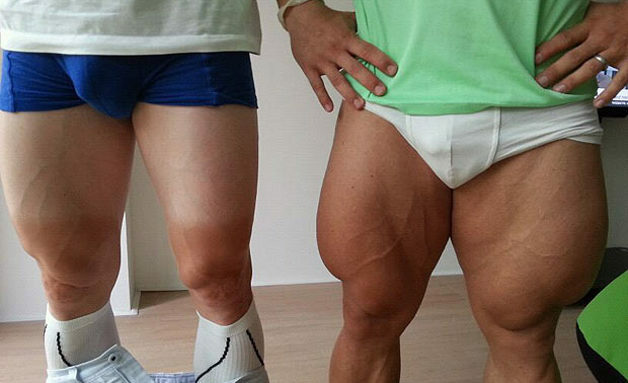 Cycling specific socks. Energy gels with added Oompa Loompa testosterone. To ride fixed is to strip all of this back and ride a bicycle as it was intended. Pure simplicity in itself. 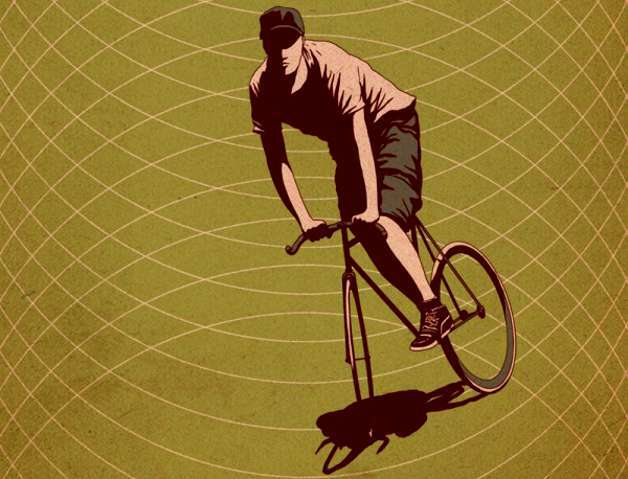 What’s the difference between a single speed, a fixed gear and a track bike? First, let’s avoid any confusion. Not all single speed bikes are fixed gear bikes. A single speed bike can either have a fixed gear or a freewheel i.e. you can roll without pedalling. 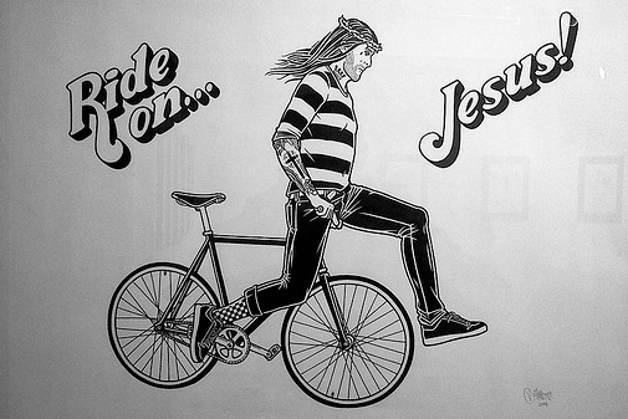 A fixed gear bike is a single speed on which you must always pedal. Why should you care? You shouldn’t, unless you’re about to ride 100 miles and have a choice between the two! What about a track bike, what’s that all about then? A track bike is a fixed gear bike. Simple. Or is it? Track bikes must meet stringent regulations to actually be ridden on a track. This includes a high bottom bracket clearance and a short crank arm length enabling you to negotiate the banked curves of the track without striking the pedal. More importantly, a track bike cannot have brakes if used for its intended purpose. Brakes on a track are considered dangerous when everybody else is riding brakeless. If you want brakes on a track bike you better come equipped with a drill. Finally the geometry of the frame is engineered for the pure speed of the track so a track bike will ride a little harsher on the road and a shorter wheelbase means potential toe overlap on the front wheel. Low maintenance. This was the primary motivation for my fixed purchase. Nobody enjoys cleaning chains with a toothbrush or digging out grime from a rear cog. When the fear of getting your bike dirty prevents you from riding you know you’ve got issues. Muck aside, single speed bikes have fewer parts ergo less to break or adjust. Commuting you no longer need worry about potholes damaging the wheels of your best bike either. It’s fun. This is why I would recommend a fixed gear bike. Prior to becoming a fixed convert I read so much about the supposed fun of riding a fixed gear bike and was very much what you would call my usual cynical self. How on earth could being chained to the revolutions of my cogs be so much fun? The only answer to this question is to ride fixed. There is no other explanation. Forget all of the mystical stuff, the being at one stuff, the pure cycling stuff. Just go for a ride and note the smile on your face and then you try to explain the fun. And no, fun should never need explaining. Simplicity. Not having to think about changing gear frees the mind to enjoy the ride. One less distraction. It’s you, the bike and the open (hopefully flat) road. No more crunching of gears as you accelerate away from the traffic lights. 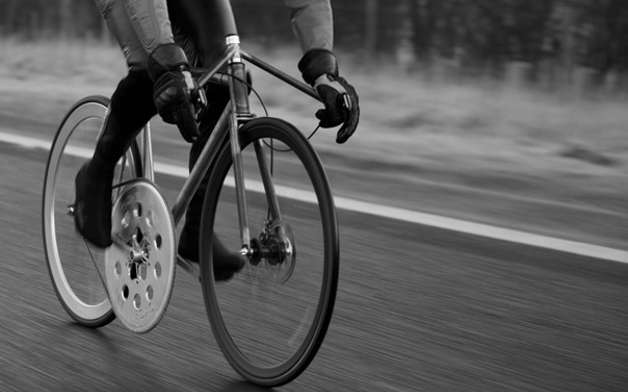 Free of gears, you’ve also shed some serious weight from your rear wheel. Light and sprightly you are. Fitness. There are many spurious claims as to the fitness benefits of riding a fixed gear bike (see fixed gear myths below) yet one thing is undeniable: you must pedal at all times. No coasting means extra effort, assuming that is you have chosen the correct gearing. Aesthetics. Only a philistine can shrug with indifference at the beautiful clean lines of a fixed gear bike. This is perhaps why the so-called hipster has jumped on a single-speed and turned the bike into something of a fashion statement. Shame the irony of the multi-coloured deep rims and tyres is seemingly lost on their aesthetic sensibilities. Will riding a fixed gear bike improve my pedalling technique and strength? Yes and no. It will not teach you some mystical pedalling technique because let’s face it, pedalling is pretty easy. You pedal in a circle, job done. Will it teach you to pull up on the pedals? No more than cleats and being fixed to your pedals would. Some say riding fixed actually makes you a lazier rider when pedalling as the motion of the chainring does the work for you. I’ll get stronger though won’t I? Maybe, depending on which gear you choose, which is the same as riding a road bike in a gear that’s a little harder than you might normally manage. So no, a fixed gear bike per se will not improve your strength or power outputs. So what will riding fixed do for my cadence? Well it will teach you to pedal all of the time. No coasting. Freewheeling quickly becomes a thing of the past. Since riding fixed for my commute, on long weekend rides on my road bike I find myself consciously forcing myself to stop pedalling when going downhill in a bid to save energy. Never coasting is a benefit and a curse depending on the type of ride you are on. Not convinced? Ask a seasoned road bike century rider to complete a hilly 100 miles on a fixed gear and take one look at their post-ride face! Pedal. At all times. You are the cycling equivalent of a shark, a prehistoric beast that must always keep moving to stay alive. Stop pedalling at your peril. Cornering. Many a new fixed rider fears tight corners and pedal strike, that moment when pedalling around a corner your pedal hits the curb or floor at the low point of the pedal stroke. In over 1,000 fixed gear rides I’m yet to encounter pedal strike. Have I found a mystical Roman road with no corners? Not exactly. My fixed bike is a track bike (hey, I liked the colour!) and thus the bottom bracket is a little higher from the floor. Added to that are my shorter than normal crank arms at 165 mm instead of the 172.5 or 175 found on most road bikes. Fit a front brake. I cannot stress the importance of this enough. Hence I go on about it quite a bit further down. You are not a better rider if you ride brakeless. You’re just slower, more tired and more of a danger to yourself and others around you. Don’t worry about a rear brake. That’s called your legs. Don’t learn how to skid. You’ve a front brake, you’ll never need to skid. OK, maybe for fun. Once. Learn to track stand. The art of track standing will improve your balance and give you more control over the bike at very slow speeds. Learn when not to track stand. Which is most of the time. You may think you’re cool track standing at the traffic lights for three minutes but you look ridiculous. Besides, it’s a complete waste of energy. But you’ll get away from the lights quicker right? Maybe. Or maybe you have an overgeared bike and so gaining momentum is oh so slow and you’ve been passed by everyone who pushed off the floor with their feet and clipped in quickly with their double-sided cleats. Track standing at busy ASLs in close proximity to other cyclists is also dangerous as you edge to and fro into the line of other riders. Learn how to start from a stop position. Assuming you’ve realised track stands are well, for the track, you’ll need to either i) come to a stop with the pedals in a position that allows you to accelerate (so leading foot positioned between 1-3 pm on a clock face) or ii) use your front brake to lift the rear wheel the 1 mm off the ground required to quickly spin your leading foot into position – a trick that you will soon master in the blink of an eye. Learn how to spin downhill. I’m not going to lie. I look and feel ridiculous spinning away at 140 rpm down a steep hill. Control over the bike is also more difficult. Embrace the spin or alternatively learn how to control the bike and roll gently down a hill. Again, here’s where brakes help. Increase your vigilance. Even though I ride fixed with brakes, I have found I have a better awareness of everything happening around me. As mentioned above, riding fixed is like learning how to ride all over again and so you begin to appreciate the flow of the roads much more, slowing down by leg power rather than caliper power. There’s something about riding fixed that makes you never want to stop and so you’ll pace yourself towards traffic lights so that you’ll never lose your momentum (without becoming a red light jumper). Choose gears and routes carefully. You don’t want to be undergeared and spinning away any more than you want to be overgeared and mashing your way up hills. More on gears further down the blog. Get the right chain tension and a straight chainline. This simply means getting the chain tension nice and tight. Not too tight otherwise you’ll find turning the cogs a little stiff. Too loose and you risk serious injury should your chain jump off. The chain should be as tight as possible whilst still allowing free movement of the drive chain. A straight chainline will ensure 100 percent connection with the chain and cogs, hence they’ll be less likely to slip off. Bunny hop whilst pedalling. 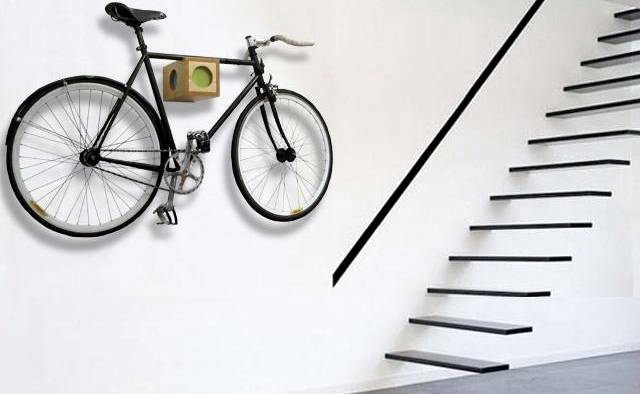 A difficult but must-have trick for fixed gear bike riding. Forget track stands and skidding, the bunny hop is the trick you need to beat those pesky potholes. Start small and move slowly before working your way up. Beware of flares and laces. You don’t want anything getting caught in a fixed gear chain. Oh no. Look cool. You’re riding a single speed bike, you must be a hipster, right? Don’t ride like a moron. Excuse my language, but there does seem to be a strong correlation between the number of singlespeed (not necessarily fixed gear) riders and those with a blatant disregard for every other road user. Sure, cyclists riding all sorts of bikes can be idiots yet my experience here in London tends to lean heavily towards those riding a single speed. Can I ride fixed gear without brakes? Sure. You can also jump out of aeroplanes without a parachute or ride a motorbike naked. I just wouldn’t recommend it. Yes, your legs can act as brakes. So too your head when you hit the back of a bus that stops suddenly. But, but, my legs are really strong. Sure, rely on your legs to stop you, just make sure you quadruple your breaking distances and don’t travel over 10 miles per hour. Ah yes, but I know how to perform skids on my fixed gear. That may be, but if you’re skidding then you’re not riding a big enough gear to get a decent speed (at least not for me!) and you had better have a good supplier of tyres and more money than sense. Finally, remember that riding a fixed gear bike without brakes is illegal here in the UK unless you’re on a track. A front brake is a must for me. My fixed is my commuting bike here in London, a city where a brake is as essential as sharp elbows and the ability to avoid eye contact during rush hour on the Tube. Brakes save me energy as I no longer need to pedal backwards to slow myself down and I can also cycle much faster safe in the knowledge that I can stop as quickly as any other bike on the road. Does a front brake really upset the true beauty of your bike and the ride? No, you only use it when you need to and from an aesthetic point of view, most people who chat to me about riding fixed at traffic lights ask if my bike has brakes, so discreet is my set-up. Are fixed gear bikes dangerous? Bikes of any form are not dangerous, riders are. Follow the tips above, use your front brake and you’ll be fine. Are fixed bikes safer than road bikes? No safer, no more dangerous. You could argue the chain is less likely to fall off, but when it does you will certainly know about it. You’ll need to relearn how to ride a bike without coasting otherwise it’s buckaroo time and a chance to test your rodeo skills, which you will almost certainly experience when first climbing on a fixed gear bike. After that, the greatest danger comes in behaving like an idiot, but it was ever thus. Is riding fixed bad for my knees? Only if you ride the wrong gear, pretty much like selecting the wrong gears on a road bike. You don’t want to be mashing away on a huge gear and neither do you want to be spinning a tiny gear. Much depends on where you ride. If you’re in a hilly part of the world then a fixed gear bike may not be for you (although judging by the number of fixed gear bikes I saw in San Francisco , much also depends on your fitness). Should I buy a fixed gear bike? This very much depends on the riding you want to do. Flat commute? Go for it. Hilly, long distance Audax rides? Probably not unless you like suffering. Horses for courses, as any amateur gambler knows. Want to look cool? Sure, go for it but you can achieve the same riding a single speed with a free wheel (see obligatory fixie hipster slurs below). Either way, some will label you for riding a bike with one gear but then such things are not a worry to anybody wearing a moustache or Lycra, or anybody who rides what the hell they want to ride! I spent months debating whether to go fixed or freewheel, mostly because riding fixed seemed very daunting, plus I knew I would have to go clipless too, something I swore never to do commuting in London. My worries quickly dissipated once I began riding. Sure, there’s an initial learning curve but once overcome you will wonder how you cycled for so long without enjoying the purest form of cycling pleasure there is; riding fixed. 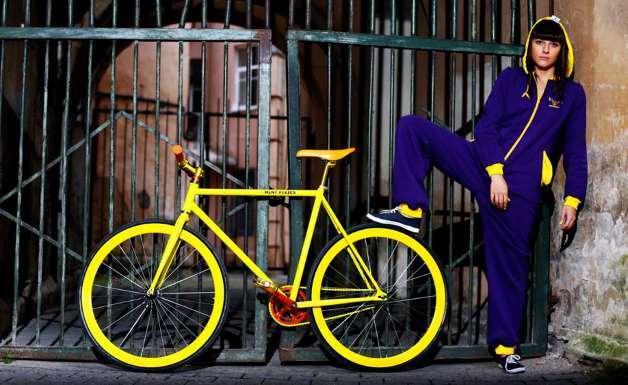 I thought fixies were for hipsters? 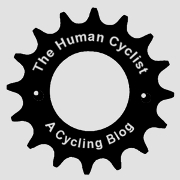 I cannot write a blog on single speed bikes without mentioning the H word. Sure, the bearded men and moustachioed women of downtown Dalston here in Londinium may prefer to ride a bike with one gear, but observe closely and you’ll notice that 47 times out of 48, the bike has a freewheel and is a single speed rather than a fixed gear bike. Boat shoes and fixed wheel bikes don’t tend to get along too well. Anyhow, who cares? Cycling is meant to be fun. Ride what makes you smile. You’re a cyclist, since when has style or fashion come into your decision-making process? You live for the days when snot runs down your face, the interval sessions that turn your head beetroot, or when the rain soaks you thoroughly and you look like a drowned rat. 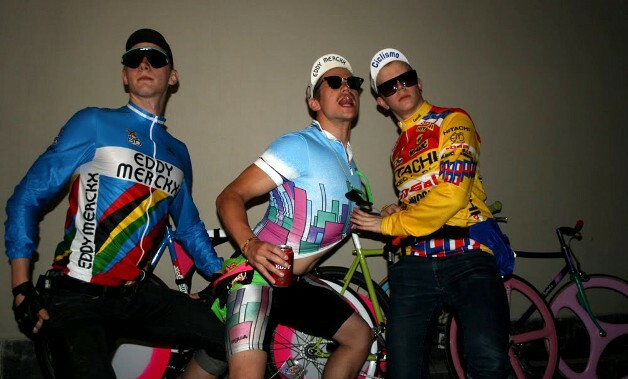 So don’t worry about being labelled a hipster, it might actually make a change to being labelled a cyclist. OK, I’m sold, but what it’s called again? Fixie or fixed? 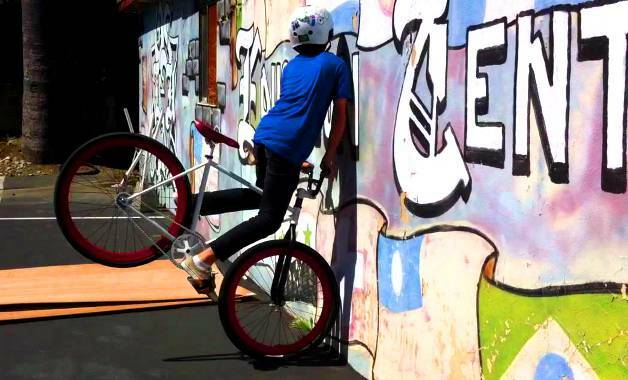 The word fixie has become synonymous with the hipster craze for riding, er single speed bikes even though most do not actually ride fixed gear bikes. Walk into your local bike shop and ask for a fixie and you’ll be ushered towards the bright multi-coloured bikes with cheap components parked in front of the skinny fit three-quarter length jeans (and any other stereotype I can muster). Ask for a fixed gear bike in a gruff voice and depending on the size of your thighs, you’ll either be taken towards the black track bikes with no brakes or over towards some nice looking fixed gear bikes with front brakes ready for road riding. Alternatively you could build your own fixed gear, which is definitely on my cycling bucket list one cold winter day. What gears should I ride and what the heck is a flip-flop hub? A flip-flop hub is essentially a back wheel with two gears, one on either side of the wheel, allowing you to flip the wheel around and choose another gear. Handy eh? Now, don’t think of this as a mid-ride gear change, because flipping your wheel every time you hit a hill is inconvenient to say the least, especially for the bunch waiting for you at the top. A flip-flop hub allows you to choose between two gears or alternatively between a freewheel and fixed gear. You can have a small cog for those fast flat rides when you’re focussing on strength and a big cog on the other side for when you just want to spin away like a hamster on a wheel. I tend to avoid extremes when choosing my gears although my flip-flop combination does have a broadish range (14 and 17 tooth) to ensure my ride is comfortable but very different whichever gear I choose. Most people use a flip-flop hub to alternate between riding fixed and coasting along on a freewheel. Having a road bike with all of the free-wheeling gears I need, I don’t really need such freedom but can understand why the thought of riding fixed on tired legs might have me reaching for the spanner set. There is no universal optimum gear for riding fixed just like there’s no one best anything for anybody. Much will depend on four things: terrain, fitness, cadence and your desired average speed. You can search as many forums as you like to find the best gear ratio but the only way to find that magic formula is to experiment. Use a gear calculator to begin with, which will help you understand what gears are required for certain speeds when riding different cadences. Finding the right gear is like finding the right woman or man. Many will seem attractive but it’s not until you’ve spent some time with them and er, ridden ’em until you’ll really know. Once the magic happens you will never flirt with another gearing ever again. Me? Well, I’m in denial. I ride gears either side of what I think my special gear will be. I ride a 42 on the front simply because it came with the bike (in truth I’d prefer something a little bigger from a purely aesthetic view, along with a minor uplift in efficiency too – big front cogs transfer more power than small cogs). On the back I ride either 14 or 17 depending on how I feel. The 14 is a little tough going when accelerating from a standing stop but I like to mash out some quick revolutions on this gear when feeling strong. The 17 is almost perfect for commuting but is a little too spinny, which helps ensure I stick to low tempo recovery rides, something I am incapable of doing on a geared bike. Some day I’ll splash out on that special something, which is probably a 16. In the meantime I’ll continue to enjoy the tease. So off you go, deep into that murky world of gear ratios and gear inches and 44×16, 48×16 and 52×19 debates that will drive you crazy and leave others looking bemused. Before you know it you’ll begin researching skid patches, alienating even your closest of riding friends. Ride fixed, ride free. Whatever you ride, smile. Not for my old legs. Great post, and timely as well. I just started commuting on my fixed gear last week, and for my first experience, I agree with your second point. It is a lot of fun. It has given me great feedback on my pedal stroke, and I noticed it this past weekend on my road bike. No more coasting at the top to the hills. Sounds like you’re having fun Steven. It’s amazing but you never really lose that fun factor even after all of these years. Never tried it but you’ve got me tempted. Thanks! I have two track bikes. I used to ride at a Velodrome but found it hard to find anyone close to my age to ride with or race against. When I was a teenager I used a front brake on the street and then took it off when racing. What I find is it simply amazing is that an old good steel frame makes for a great ride. I ride a 75 year old six-day Schwinn Paramount with sew-ups, new cranks, cogs, chain pitch that is really fun to ride. No brakes on the bike. My other stiff hub ride is a new Fuji Track Pro with clinchers and a front brake. I had to add the brake when riding in traffic or to go down hills. I got my 1939 Paramount when I was in Junior High School 50 years ago. I can’t say I have been riding it all these years at it set hanging in a garage for many years but now it is ridden several times a week. Not saying it is a record or much of a boast but not many blokes can say they are still riding the same bike after 50 years. 50 years on the same bike is pretty amazing. I wish I still had a few of my old steel frames. Beautiful looking things they were, a pleasure to ride. I still enjoy riding my steel framed fixed gear more than I do my road bike, it’s just a different sensation. Keep on riding. Great informative post. I have been riding fixed gear now for about 7 years. Next week I am setting out on Biking Across Kansas and for the first time I am going to do it on a fixed gear. 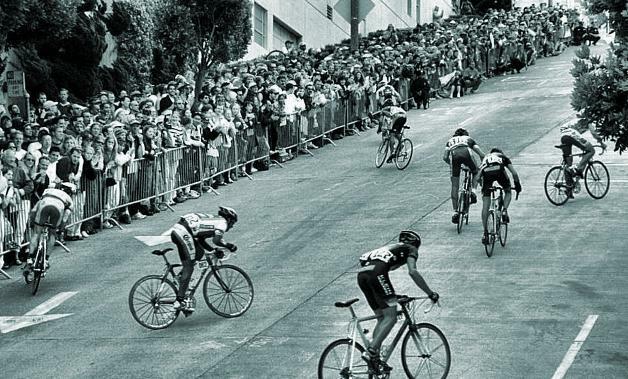 I have been doing it for years on a road bike thinking of how I could do it on a fixed gear and be able to switch to a lower gear quickly for the steeper hills in eastern Kansas. Surly now makes a Dingle Cog which mounts like a fixed gear but has two different gears. That means one can put two chainrings up front separated by the same amount of teeth. I will have a 46-17 for the flat part of Kansas and a 42-21 for the hill climbing. I just have to stop, loosen the back wheel and move the chain to the other cogs without completely removing the wheel. Thanks Bryan. Sounds like you’ve quite the adventure ahead. I love the idea of touring on a fixed but have not yet been brave enough. Your solution sounds ideal, I’ll check it out. Enjoy the ride across Kansas. I just got my second fixed gear bike, and while I’m pretty good at using my legs to slow down, I agree that a front brake is essential, particularly in a busy city. The guy who built it for me put the brake in a strange position, for me at least. It is placed right be the stem, running parallel to the handlebar. Since these are bullhorns and I’m usually hunkered down to ride, I have to straighten up and switch hand positions to use the brake, which feels awkward to me. Will I get used to doing that, or should I move the brake to stem portion of the bullhorn? Sounds like the same set up as me. I was used to riding my road bike so it was certainly odd grasping for brakes that were not on the drops. This soon passed though. You quickly pick up the new habit. That said, you might want to swap the brakes if you are always in the drops. I rarely hit the drops commuting in London, much safer to be up straight. I did consider swapping for some straight bars but I like the option of getting down when the wind picks up. Chris, what I would recommend with bullhorns is to get a brake lever that can go on the end of the bar with the lever coming back. They are common on a tri-bike at the end of the bars. I judge my brake lever position with my most common hand position. Sounds like you ride with your body extended out and your hands out on the bullhorns so that is where you need the brake lever to be. Chances are if your hand is in the position where he put the lever you are not going to be traveling at such a high speed as you would be when you are hunkered down. Sounds like the builder should have communicated better with you and asked which position is common for you. But then maybe he thought you were just another hipster and wanted a cool looking fixie. The only problem is those brake levers only come in pairs. So buy them and if you only want a front brake put the other one up and save it. They are fragile in a crash so you may need the spare someday. Aesthetically I’d be tempted to put both brake levers on rather than just one. I think that’s why a lot of builders opt for the single brake near the stem. A single brake on the hood just looks odd! I moved my brake lever closer to the bullhorns so it can be used when your hands are on the outside of the bull horns. Like you I’ve been debating riding fixed for a few months – this is easily the best article I’ve read on the subject, many thanks. But I’m still unsure how to deal with some situations, for example, when filtering between a high kerb and cars at lights, keeping the kerb-side pedal raised is essential. How do you deal with this with a fixed gear? Similarly, I’d imagine that navigating through gridlocked traffic is trickier when wheels and pedals aren’t independent, and when riding with a ratio that makes spinning out less likely. Do you find traffic significantly more difficult when riding 42×17 vs 42×14? Hi Paul and thanks, glad it’s been helpful. High curbs and filtering, this can be an issue. However, you’d be surprised the gaps you can fit through so it’s about judgement. I rarely find this to be an obstacle and when I do, I either hang back, or more likely filter on the other side. I have shorter cranks so I only watch for really high curbs. There’s little difference with the harder ratios. I’ve also ridden with a 13. You will be slower accelerating away, or faster if you are a powerful rider! I actually find the bike easier to control with my 42X14 as there is less movement of the bike per crank movement. The 17 is more fun though. I say go for it. I love riding fixed despite similar concerns to yourself when I first began. What is it about fixed gear that is drawing your interest? Mostly, lack of maintenance. I have about as much interest in maintaining my bike as I do the Tube I used to ride. That attitude resulted in the purchase of two new cassettes over the last year. A lack of faith in bike shops – largely down to one incident where a mis-set limiter screw caused my rear wheel to lock up when downshifting on Oxford St – further motivated my interest in something ‘simple’. So I bought a Canyon Commuter 7.0. On paper, the belt drive, internal hub, dynamo and integrated lights seemed perfect. The candle burned bright, but only for a little while and it’s now returning to its factory. Although magnificent in many ways, I’m not sure it was quite production-ready. So now I want something truly simple. A singlespeed fits that bill, but the mechanical sympathy of a fixed gear offers another level of appeal and I feel compelled to at least try. I feel your pain. Bike shop service is like the NHS, hit and miss. Taking your bike in is like going to hospital for an operation. You never know what condition you / your bike will come out in. A single speed is definitely for you. Low maintenance? I bought mine secondhand almost three years ago and have just changed the chain. Zero other maintenance bar brake pads. I haven’t even cleaned it bar the occasional frame wipe down. Brilliant. Get yourself a set up with a thick chain and just remember to lube it. Job done. If you are unsure about fixed then go for a flipflop hub. That way you can try fixed and if you don’t like it then you can go freewheel. Good luck and enjoy. Nothing beats the simplicity of riding single speed. G’day-great article. Wish I’d found it before buying a track bike with no brakes to learn on, but after my first couple of rides I’m getting used to back pedalling and keeping speeds low enough to deal with other vehicles. My commute in Auckland is far more relaxed than my old London one though, so I can see why you’re recommending the front brake; am I right in thinking I’d need a new front wheel with clincher rim, and either a new fork or a friend with a drill to apply one? Also wondering whether a tyre upgrade might be required…are track tyres thinner? In general though, so much fun cruising on my silent steel steed-love it. Hey Coney, sounds like you’re learning to ride all over again! You don’t need a clincher rim, depending on what wheel you might just need to get the rim machined for a brake, so new wheel probably easier then! As you say, drill or new fork. Your local bike shop might drill it for you. Track tyres won’t have much puncture resistance or grip so your call on whether to change. Have you ridden the track tyres in the wet yet? That might give you a quick answer! Great article, rode fixed for my commute today for the first time. Enjoyable, apart from the puncture when I hit a raised kerb. Question: how “harD” should the front brake be set? I don’t feel currently that I could come to an emergency stop, which doesn’t seem right, but I don’t want to be flying over the handlebars every time I want to slow down a little! Thanks Brendan. Sounds like you’re having fun! I personally don’t like super sharp brakes. They can be jerky and so I loosen them off a little but still make sure the pads are close to the rim and the brake cable is pretty tight. Even with a back brake you wouldn’t come to a full stop anyway. Riding fixed takes a little time for your brain to dial in the new braking distances. Until then take it easy and make minor adjustments to your brakes until you are comfortable. That’s a very interesting article for fixie lovers! Thanks Rob. Therapeutic, that’s a lovely wore to describe cycling, particularly fixed riding. Keep on spinning. Great read….Just picked up my first fixed gear bike and had my inaugural ride today. Price was right and so was the fit. Aluminum frame with a carbon fork so I am amazed at how light it is. More amazing is the difference in the experience. It’s night and day. I can’t wait for my next ride. I work in DC and need to move between properties all day and this is so much more enjoyable on a bike, and fixed at that. Already thinking about new gearing and handlebars. Thanks Erik, your fixed gear addiction begins! I still love climbing on my fixed, magical. Hey Daryl, welcome to fixed world! Great to hear you might be able to enjoy traffic dodging (a little!). I’ve been commuting on singlespeed for 2 years and love it so decided to buy a flip flop wheel last week to give fixed a try. For some reason it didn’t work for me. Stuck in a queue of 4 cars at a tight give way junction proved very problematic as I had to edge forward clipped in. I also discovered later that I can’t even use the freewheel as I’ve always used 42×15 on the SS but they don’t make freewheel sprockets that small. That might be a blessing in disguise though and encourage me to try fixed again. After reading this I fancy giving it another try. Persist, it does take a little getting used to. There’s few gaps I can’t get down, some is just about confidence and learning when your pedal will strike the kerb. Edging forward, I find this is as much about anticipation as anything, rolling slowly up and taking a positive position if you do need to wait. I recently had to put my fixed into storage for a month and commute on gears again, I’d forgotten how complicated it was! So happy to be back on fixed, what a feeling! Give it a couple of weeks and see how you get on. I just noticed that it was over a year ago that I posted my comment. I persevered and after a month or two I became a full time fixed commuter. I totally neglect my better/weekend/geared bike now. All thanks to this article. It’s almost two years since I first commented here, and likewise, I’ve being riding fixed since after this article convinced me to try it out. I have a old(ish) GT road bike and I just got a set of state bicycle co track wheels with a 16t rear cog. My front cog or chainring or whatever you want to call it is 39t. When I went to put on my back wheel the chain that is on it already doesn’t fit the rear cog. Does this mean that I need a new front chainring and chain or do I just need a new chain? Also thanks for writing this great article I made me super excited and motivated to get my fixed gear bike in riding condition and get out on the roads. Hey Nick, a new chain is all that is needed. I have a track frame which has vertical dropouts (where the wheel fits on the frame). This allows me to move the wheel backwards or forwards depending on the size of the rear cog I am using, whilst keeping a tight chain. I then size my chain so it fits my biggest desired cog (if you plan on changing it every now and then). Enjoy the ride! I’d check the rear cassette and front chainring widths and make sure they are compatible. There’s two sizes of chains that can be used on a fixed wheel, 1/8″ and 3/32″. It’s cheaper to change the rear! Great article and very informative. I’ve been a cyclist for a couple of decades but finally got around to ‘scratching that itch’. Not necessarily the flattest terrain in rural N.yorkshire but I’ve been playing on my single speed for several months, tomorrow – I ride fixed. Bike set and ready to go- wish me luck! Thanks Patrick, good luck, you’ll love it. Just choose your gearing wisely for north Yorkshire! Fantastic read which convinced me to go ahead and get a fixed gear bike to supplement my TT training! After riding it for the first couple of times, the day afterwards, the muscle soreness in my legs was very similar to the feeling the day after a tough leg session in the gym! Looking forward to using it as a winter training bike and having less to think about during the ‘dirty months’! Thanks all for coming back and updating me on your fixed adventures – it’s really great to hear this blog has inspired you and also that you’re still riding fixed. Both of those things make me very happy! Great post. I started building a fixed gear bike a few months after reading this post. Still not used to brakeless and ended up with a front and a rear brake on my bike. Its an amazing experience. It feels lighter compared to my mountain bike and folding bike. I love it. This is the perfect bike for me for just biking. If I had to carry a backpack with clothes and a laptop I switch to one of the other two bikes. Thanks Kevin, good to hear you’re enjoying fixed riding. I’d recommend trying to ride without the rear brake, a little less weight, plus no real need for the rear. Definitely keep the front on though! I’m still riding fixed every working day, love it! Man, if you can’t skid with a 42-14 it’s because you use your front brake to much. Train your legs and it will work. Nice Article, I just sold 2 of my geared bike and bought a fixed gear and just started commuting to work for 2 days with it. And It’s the best experience and also fun. It’s like learning to ride a bike again. Bottom-line it was the best decission to commute with fixed gear. Great article and comments! I have converted my old road bike to single speed year ago and last weekend set up the fixed cog. I was a bit nervous today when first time cycling fixed to work (9 km), but I managed it and it was fun ! I was near to fall two times: once when I was pedaling standing and sat down and once when I was riding downhill and forgot that I was fixed :-). Last kilometres started to feel much more normal and I could slow down the bike with by legs. And yes, I have front brake. Thanks Timo, welcome to the fixed club! When I’m very tired I still occasionally forget I’m riding fixed and can’t coast down hills! Stumbled across this article when looking for information about fixies. I have to say it was a very informative read and will help with my own blog.